Gainesville is a Census-Designated Place (CDP) located in the west of Prince William County, in Northern Virginia. According to the most recently-available census data, this community has a population of 11,481. The median household income in the area was $76,300, and about 1.9% of families and 2.8% of the population lived under the poverty line, which is far below the national average. The town has its roots as a changing point and rest stop for stagecoaches running on the Fauquier & Alexandria Turnpike. It became a major shipping point for a number of different commodities including cattle, and was an important path for soldiers during the Civil War, used to reach both the First and Second Battles of Bull Run. There are a number of historical areas in Gainesville, including the U.S. 29 Civil War Battlefield. Gainesville has a much higher median income and home value compared to the rest of Virginia, given its close proximity to Washington, D.C. The median home value of the area is estimated to be around $470,000, and the median household income is $131,287. Most people who live in Gainesville do not work in the city, but commute to the D.C. metropolitan area. Recently, the community has experienced rapid growth and development. The first major townhome community in Gainesville, Crossroads; broke ground in 1994. Since then, dozens of other planned developments have sprung up and today, Gainesville is the third-largest CDP in Prince William County. Since then, development has continued in the area. There are currently six large shopping centers in Gainesville, primarily focused around the intersection of I-66 and Virginia State Route 29. Stores in this area include Target, Best Buy, Lowes, DSW, Michaels, and more. Regal Theaters also opened a theater in the area in late 2013. For transportation, the area is primarily served by car. There was a proposed railway station extension for the VRE, which would have opened in 2022, and connected the area by commuter rail to Manassas, Fairfax County, and Washington D.C. However, this proposal was voted down, and the operations board chose to expand services to the nearby station in Broad Run, rather than add a new commuter rail station. There are no major bus or train lines in the area, leading to heavy traffic. 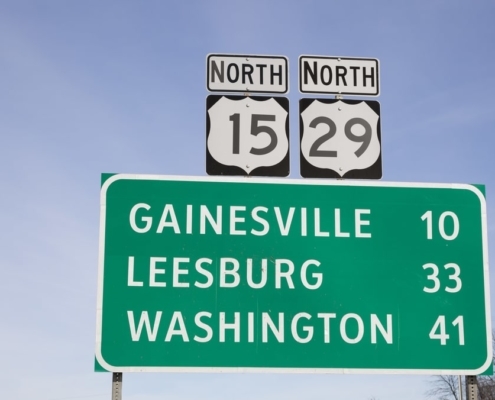 The Virginia Department of Transportation began the Gainesville Interchange project in 2006 to help ease traffic in the area. This was completed in July 2015, and has helped ease commuting both into and out of the Gainesville area. As a CDP, the area has no formal school system or central government, as it is part of Prince William County. It is served by Prince William County Public Schools, the third-largest public school district in Virginia, which serves a total of nearly 80,000 students and has been noted as one of the best school districts in all of Virginia. If you are interested in looking at property or learning more about living in Gainesville, VA, here are some helpful local resources which may help you get additional information.